I had a great surprise great mail day today! 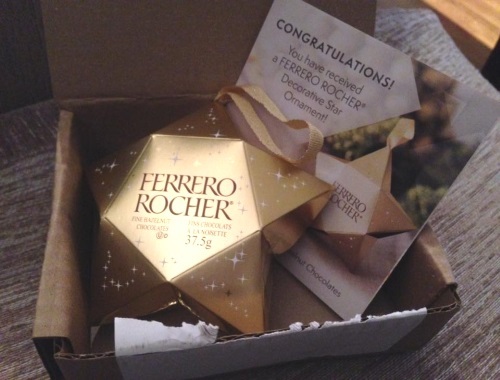 I got a Ferrero Rocher Star Ornament! If you recall this was a contest win from a Flash Giveaway that Ferrero Rocher had on their Facebook Page around Christmas, we blogged the contest here. You had to private message them to enter to win. I didn't receive any kind of indication that I had won so I wasn't expecting this at all. It came in an unmarked cardboard box, as shown in the image above. It's a cute Christmas ornament plus it also has 3 Ferrrero Rocher chocolates inside! My boyfriend joked that he does't know how this will last until Christmas! Did you get anything good in the mail lately? Let us know on our Facebook Page.